The internet is an interesting resource. Once you’ve put a reference up, it’s there forever. Over time, things may change, but that 10-year-old article doesn’t. A few weeks ago someone used some old articles I’d written (1, 2, 3) as a reason why he doesn’t use protective UV filters. They claimed I had said there was no need to use UV filters. Evaluate the cost to benefit ratio of using a UV filter. Don’t use a $100 filter to protect a $100 front element. Evaluate the situation. If you are in a high-risk environment, use a filter to maximize your protection. Never, ever use a cheap $30 filter unless you don’t care about image quality. But at that time (2010 to 2013) I wrote those posts, that meant I didn’t use UV filters very often because it usually wasn’t worth the money. Front element replacements weren’t that expensive, and high-quality UV filters were expensive. As with every article I write, there will be three or four comments saying, “I’ve had 20 different lenses and never had this problem.” Good for you. I take care of around 20,000 lenses at any given time. About 15,000 of those never had a problem either. You do the math. So I write about the problems that occur so you can be forewarned about the problems that may occur with your lenses. Forewarned is forearmed. We replace front elements in lenses for cosmetic reasons every day. Every. Damn. Day. Sure, they’re rental lenses and maybe don’t get babied as much as your lenses do. You may get lucky and never deal with any of this. But it’s always good to make an informed decision about what precautions you want to take. In this particular case, basing your decisions on 6 or 8 year old data can be a mistake. When I wrote most of those articles I talked about above, front elements cost from $70 to $200, and good filters cost $70- to $140. Today highest quality UV filters cost from $70 to $120, even in 82mm size. But the cost of replacing front elements has skyrocketed. Most people aren’t surprised that a Canon 70-200 f/2.8 IS lens ($1,800 or so) has a $270 front element, or that the Canon 24-70 f/2.8 Mk II ($1,700) runs just over $200 for a new front element. You might not even be surprised that a 150-600mm telephoto lens that costs $900 or so runs over $200 to $250 to get the front element replaced (either brand) since that is a big piece of glass. More important, perhaps, is that the cost of a front element replacement can be very high even for a not-so-expensive lens. A decade ago you could assume a relatively inexpensive lens (under $1,000) had a relatively inexpensive front element. A Canon 70-200 f/4 IS lens, for example, cost around $950 and a front element replacement was under $100. Most newly released under-$1,000 lenses will run $200-$300 for a front element replacement. My point here is not to provide a list of what every manufacturer charges for every front element. You can call or email them if you want to know. It’s not that one manufacturer has really high prices and another doesn’t. They all have some high and low-cost lenses. For example, manufacturer X has front element replacement costs that range from 9% of the lens price to 33%. If there’s a general rule it’s that lenses released 5 or more years ago are reasonable cost for front element replacement, newly released lenses are expensive. There are exceptions, of course. And so I’m clear, it’s not that the cost goes down over time. Unlike sale prices, repair prices don’t go down after the lens has been out a while. So, front element replacement costs, particularly on new lenses, are higher than they used to be and some lenses are breathtakingly higher. There are some real reasons this is so. These new, sharper lenses often have front elements that are unique glass types, nano-coated, highly aspherical and a lot of other things. 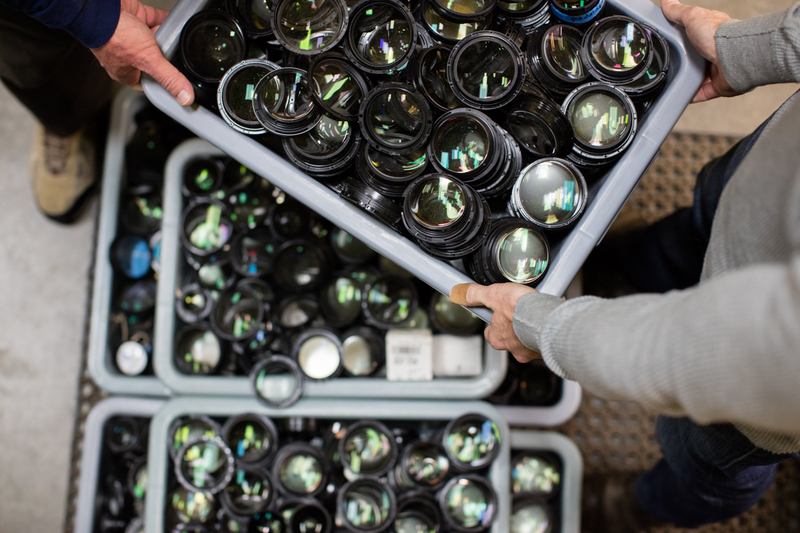 Manufacturers are pulling ever trick out of their bag to make lenses sharper and better. One of those tricks is that front elements, which often used to be simple, protective elements, got fancy. ‘Fancy’ is the optical word for damned expensive. Some of the increased expense is just poor planning. Let’s pretend, for example; the manufacturer thought, “Well, this front group is so difficult to adjust optically that the service center can’t do it. So instead of making the front element a part, let’s just make the entire front group of lens elements a part so that we can adjust it in the factory, and the service center can just replace the whole group.” I have talked to manufacturer’s lens designers who had absolutely no idea the front element was more likely to need replacing than other parts (we replace more front elements than all other parts combined). That’s not what they do; they design lenses. Small front element scratches, the kind that filters will protect against, rarely affect image quality at all. Once in a while, shooting into bright lights, you may (or may not) get some flare from the scratch. 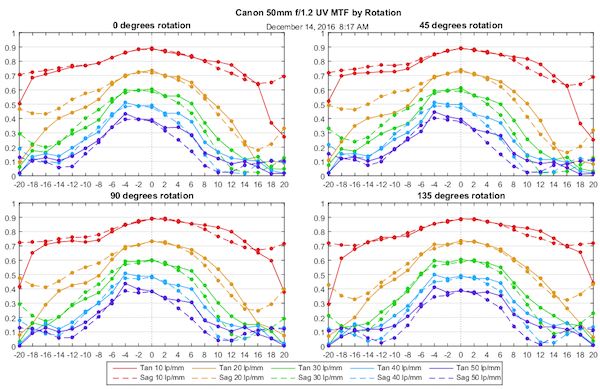 So if your lens gets some little front element scratches, as most eventually do, it matters very little. But if you plan on selling your lens at some point, it does affect resale value significantly. We make this decision every day: The lens has a small scratch on the front group, is it worth the price of replacing it? A few years ago we’d spend $100 on a new front element and get $150 more in asking price for the used lens. These days the math is different. It’s not worth spending $250 on a new front group to get a $150 higher selling price. 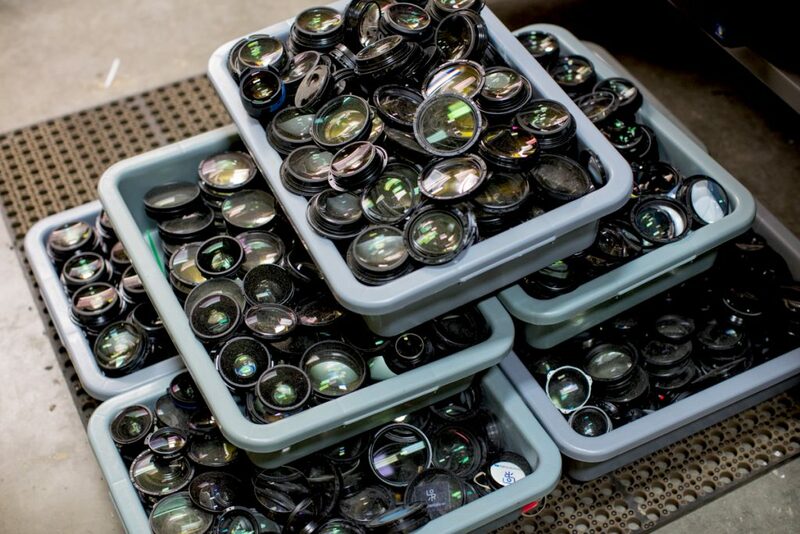 Of course, there’s a positive for people who buy used lenses. A small front element scratch means a bargain lens for sale that will function just fine. So does this mean you should put a UV filter on all of your lenses? No. I still recommend looking at the cost-to-benefit ratio for the specific lens, and considering what you’re going do with it. If it’s a lens for studio portraiture only, why bother? If you shooting surf at the beach, then you better wear protection. In most cases, a lens hood (actually mounted on the lens, not left in your bag) provides plenty of front element protection. Wide-angle lenses are a unique case, though, since those hoods don’t provide much protection. But if you are outdoors and your lens is exposed to dust, sand, water, or other things lenses don’t like, then a hood doesn’t provide protection and UV filter is probably worthwhile. Well, if you buy a $30 filter, then it can impact the image a lot. Waviness in the thickness of glass, poor coatings, poor quality glass, even shiny metal in the mounting ring can cause problems. If you choose to buy a cheap filter, you’ll probably see effects if you look critically; although it won’t be in every shot. You may see some effect on absolute sharpness, but you’re far more likely to see effects from light flare, ugly bokeh, ghosting, and reflections. A high-quality filter is made from good optical glass, flat to within 1/4 wavelength, and multicoated on BOTH SIDES. It’s expensive, but it doesn’t have much effect on image quality at all. (When you do your filter shopping, make sure the filter is coated on both sides; some cheap filter makers multicoat one side only, then advertise it as multicoated). A good filter should avoid most (not all, but almost all) effects regarding ghosting, flare, and reflection. It shouldn’t affect sharpness even at the highest level of measurement. Here’s an example of a Canon 50mm f/1.2 lens tested on our optical bench to demonstrate there’s no sharpness penalty with an excellent filter. First the lens with no filter at all. And then tested with a high-quality UV filter in place. There are no effects on MTF from the filter, either on or off axis. 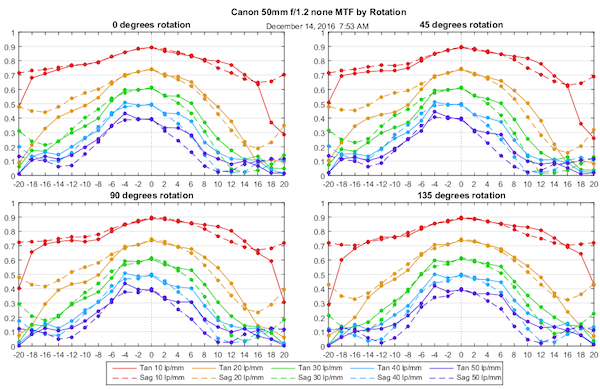 This doesn’t mean there might not be a bit of ghosting if you’re shooting street lights at night or star trails, etc. But it won’t be often, and you can always remove the filter if you notice that happening in a particular shot. So Do I Recommend Filters Now? Not necessarily, no. I support common sense and looking at the cost-to-benefit ratio. But if you have one of the newer lenses, especially if you know the front element has Nano-coating, is aspherical, or is just expensive to replace, then I’d certainly at least have a filter available. I’d especially recommend it if you expect you might sell that lens someday; even a minor scratch is probably a 10% price reduction on the retail market. If you say they’ll pry that lens out of your cold, dead fingers, then I wouldn’t worry so much. I also really recommend you look carefully at the filter threads and front element BEFORE you mount a filter on the lens, especially if it’s an ‘ultra-thin’ filter. Several lenses we know of have slightly projecting front elements, and some ultra-thin filters can actually touch the center of the front element causing a scratch if the filter is tightened all the way down. While I’m on the subject of touching the front element, though, those nice new thick lens caps a lot of manufacturers use these days, the ones with the big spring-loaded squeeze release handles, are a problem for some lenses, especially when they are 82mm wide. There’s a lot of plastic underneath that cap, right over the center of the lens. If the lens cap gets pushed down in the middle, it can scrape the front element. I know: glass is harder than plastic. But coatings aren’t. And a coating scratch is just as visible as a glass scratch. The main benefit of using a UV filter is to avoid having to clean dust from the lens, and prevent fingerprints. Both dust and fingerprints are easy to remove from filters (which are flat): it’s easier to clean the filters than the curved front elements. If I am in a high-flare situation, I will remove the filters temporarily. Most of my photography is outdoors. Summary: It’s easier and better to keep a lens clean than to clean it constantly. Window glass will let through UV-A quite effectively, which is why fabrics, posters, etc. fade over time in sunny rooms. This property of window glass can be demonstrated by using a UV-converted camera (with the appropriate UV-passing lens) to photograph in a sunny room, or even just using live view with this equipment. See also Figure 8 here: http://www.company7.com/library/nikon/Reflected_UV_Imaging_for_Forensics_V2.pdf. However, UV-B, which causes sunburn, is filtered out by window glass. This is the best and most comprehensive explanation I have ever read and it cleared a lot of confusion. thank you Roger. Regards Lars. Greatly enjoy the things you do! I learn from you and your tests. You for sure can find the truth on anything photography gear related. Thank you Roger Cicala. I guess I have a stubborn mind at times (you see where this is going). When I first got into photography, a complete newbie about ten years ago, I could to my surprise (knew nothing) see the damage cheap filters do almost every time. Don’t buy filter from a store like Walmart, a low end filter. No question. I have seen very little (only 1 filter) problems with Hoya PRO type filters for many years. I have done many pixel peeping tests to convince me, a pixel peeper, that my personal filters are not hurting pictures that I should remove the filter. I am not promoting Hoya Filters, I have no connection with them. It’s just what I am willing to pay. they were in my price range. If I need a Hoya 72mm UV filter say Hoya HD filter. I won’t shop for the cheapest 72mm Hoya HD UV filter, that to me is asking for problems. I shop for a decent normal price and buy from well rated sellers. Common sense buying you could say, that most of us do. Now that being said. The last Hoya filter I buy did hurt the IQ of my 35mm f/2.4 lens. The lens has very low reflectiveness, the front element looks dark. Meaning light does not bounce back off the glass much. A Hoya Pro1 Digital filter showed ghosting under the right condition. I then subjected all my filters and lens to the same test. Only this lens filter combo had a problem. FWIW the funny part is this lens uses a coating Pentax calls its ghostless coating. Well it works as claimed if you don’t ruin it by putting a filter in front of it. I am not saying your findings are wrong, they are right. But as long as the filter does not hurt my pictures that I can see with my eyes, I use them on some lens. For me. When I determine my filter is not hurting IQ at all. I keep them on some (not all) of my lens to protect the front element from flying debri and years of chronic cleaning. I am just echoing what you wrote in my personal experience. I wonder, I think I would bet most front elements get harmed more from people cleaning them versus something hitting them. Only you may know that. Your articles are incredibly insightful and not material easy to find in a youtube video. Thanks! You should check with a local college, and see if they offer glass blowing classes. They might be able to make you some pretty cool lens art. I would like clip.on filters or uv filters held by the outer part of the lens. Like.a.see thru lens cap. Easily removed but allow shooting quickly when needed. Regarding lens hoods Sony charges an arm and a leg. I used to be able to find Nikon original, used, new or 3rd party locally at bhphoto for 7 to 25 dollars. But I lost the hood for the sony e 16-70 mm. Nowhere to be found. Can’t buy it from Sony us site. They referred me to a vendor and the price was $50. I was lucky to find one at keh for 15 or so. Sony lens hoods are.too expensive unlike sigma, Nikon, roki on Easy to lose. May gaff tape them on when in the field. All the money spent on Nano coating the front element is completely wasted if there is a filter in-front. The Nano coating is designed to shed moisture & dirt so you can keep shooting in adverse conditions. The filter will likely not have that Nano coating, so it will fog-up and get smeary much faster. Actually on digital using a UV or clear glass is the same. Many people use UV because they are more widely available, or they kept their old film-era ones (I do!). Also prices are similar for the same quality. Always enjoyed surfing when living close to the ocean. You can actually do surfing in Japan (did you mean Japan by “the islands”?). When you are in Tokyo giving your classes you can either go south-west to the Kamakura/Enoshima area (Sagami Bay) or east to Chiba. After Fukushima I was happy that I used to live close to Sagami Bay and surf there as it is further away from the Fukushima reactor site… But then there is less swell there. So many things to optimize! Else, no surfing in Berlin :-(. I was afraid of that 🙂 It’s really a tough thing to compare, to do it right you’d need an interferometer to check the glass smoothness, transmission equipment, probably reflection equipment too. It’s too big of an undertaking for us, at least it would be to do it right. Thanks for the reminder Roger – I loved the 50 filter stack article! What I was hoping for was a comparative MTF review of the good filters. Without buying them all, it’s hard to know whether you’re spending good money on something for the brand, or whether it’s genuinely for the quality. Glen, it’s not the filter, it’s the lens. The front element bulges out in the center, an ultra-thin filter can get screwed on tightly enough to touch – especially if it’s a wide front, like 82mm where there can be a little bowing. Canon 24-70 f/2.8 Mk II have this happen a fair amount. Whatever floats your boat. The UV part isn’t useful at all, but it causes no harm.